Dr. Cloutier has had a very long and storied career in dentistry, and over the years, he has literally helped countless smiles shine their brightest. He still gets the same feeling of satisfaction with every happy patient that he did when he first started practicing, and he can’t wait to take care of you and your loved ones so you can all enjoy sustained oral health and complete confidence with every smile. Before that, you can get to know him a little better by reading on below. Dr. Cloutier received his dental degree from the University of Illinois and went on to do a general practice residency at Yale-New Haven Hospital. Afterward, he taught for many years in the Yale-New Haven Hospital dental department as an associate clinical professor. Dr. Cloutier is a Master in the Academy of General Dentistry as well as a Fellow of the American College of Dentists and the International College of Dentists. He is a member of the Pierre Fauchard Society, OKU (National Honorary Dental Society), and Connecticut’s Horace Wells Society. He is also a lifetime member of the Christian Medical & Dental Association. 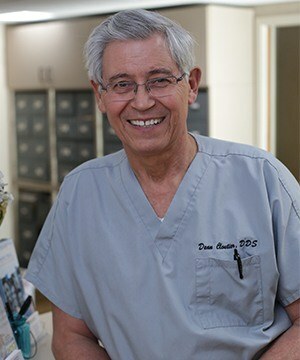 Dr. Cloutier has been actively involved in organized dentistry and was president of both the New Haven Dental Association and the Connecticut State Dental Association. He has also represented Connecticut at the national level. Over the years, he has provided volunteer services for Yale New Haven Hospital, Hill Health Center, Columbus House, and Missions of Mercy. He still participates in short term dental missions throughout the world. He has also been featured as one of Connecticut’s top dentists in Connecticut Magazine as well as other regional and local publications.